(Writer’s note: The following are excerpt from my novel, Wings of Desire, to be published by Anvil first quarter of 2014). Ahhh, that sound, how can I forget that sound? Dusk had fallen by then, and we were home. Papa always told us to be home as soon as the chickens had roosted on the star-apple trees in the yard. Ludy explained to us why, in her gentle Bicolano accent, her diphthongs rising and falling: “You should be home before dark. Otherwise, you would get in the way of the spirits, who would be abroad by then, hala!” Then she would enumerate all these spirits as if they were her childhood playmates. And so we would be home by six, sitting cross-legged in front of the TV set Papa had bought. We were watching our modern-day gods. Shazam with head shaven, except for a ponytail sticking out from the top of his head. The caveman Thor with the mighty club, which vibrates and emits waves of energy and light. The Japanese robot Gigantor, his body the size and shape of a ref, heaving himself from earth to air in an instant. But once a week, the lights would suddenly go off as soon as darkness fell. And then the sound would come. It was something we first felt rather than heard. A heavy gurgling in the air, water swirling in the throat of a giant. Then it would come nearer, louder, what sounded like trucks lumbering blindly in the darkness. I never knew what they were from either Papa or Mama. From the gossip that Ludy exchanged religiously with Nova, the housemaid next door, I knew they were the six-by-six military trucks again. The day after the blackout, the chapel would be filled again. There would be stands of calachuchi flowers and throngs of people. Sitting in front would be young women, girls really, in black. Their young children wore strips of black ribbons on their chest. And lined in front of the altar would be the coffins. “Who died?” I would ask Ludy in the middle of the Mass. Ludy sat beside me, while Mama conducted the choir. With every movement of her wooden stick (I secretly called it her magic wand), the voices of teenagers would rise and fall, become louder and softer, glide or float. Papa would be with his friends, fellow military officers, standing near the door, talking about their roosters and the cockpits, who is stealing from whom this time, clocking Padre Pelagio’s sermon with their watches. But Ludy would answer my questions with a gesture. Forefinger on her lips. Sssssh, telling me both to shut up and to remind me never to ask the same question again, ever. Years later, whenever I saw a motel chain called The Queen Victoria, I would remember Ludy. Above the blazing neon sign is the figure of a young woman with big, wondering eyes, forefinger over her luscious lips. (Sssssh). Even when I was only ten years old, I was already an avid reader of the Philippines Free Press. My father would buy this magazine from the commissary every week. I read the poems and the feature articles, the essays and the stories, even if I could not understand all of them. But some things would remain with me, like grains of sugar left on the bottom of a cup. One day in January, Ferdinand Marcos delivered his State of the Nation Address. We were watching him on TV. Sometimes, the camera would pan the crowd of student activists outside, then back to the majestic halls again, where the President spoke. “But which nation?” The students massed in front of the old Congress Building must have asked that question amongst themselves as the President’s words boomed through the huge speakers. They were all there, the students from Manila’s exclusive Catholic universities for the elite, boys in thick eyeglasses, long-sleeved white cotton shirts, ties running down their chests. The girls also came, in their white blouses and blue dresses cut above the knees. For this “out-of-school activity”, they have asked their housemaids to fold and re-sew their hemlines the night before, so they could bare more legs. There were also students from Manila’s boisterous diploma mills. Boys in their Beatles haircut, Vonnel V-necked shirts and tight double-knit pants. The girls came in bright minis that stopped a throb away from their knickers. But now they numbered in the thousands, joined even by the workers from the working-class districts of Quiapo, Sta. Cruz, and Tondo and by students from Southern Luzon. Ranged against them were the cops and soldiers, bristling with wooden sticks, truncheons, and shields. And then the doors of Congress opened. First came the Ministers, the Assistant Ministers, and the Assistants to the Assistant Ministers – the crows, the cockroaches, the worms. Then, there was the President, with eyes like a pig’s, his face turning greasy with the years. And like Lady Macbeth, there was the First Lady, with her big and lacquered hair, her dress with its butterfly wings, her bosom heaving, overflowing with love for the wretched of this archipelago. Then from the student’s ranks someone threw a crocodile made from carton, right into the First Couple’s direction. The President and the First Lady ducked in time. Escorts herded them past the crowd, and they soon disappeared into their stretch black limousine. After this, the Free Press said, came the madness. 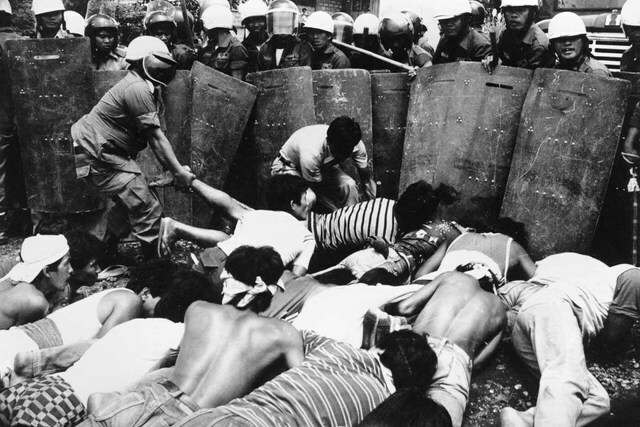 The police and the military swooped down on the students, their wooden sticks and trenches swinging wildly. They bashed heads, shattered arms and knees. In turn, the students threw rocks and Molotov cocktails, a rain of curses on the cops and soldiers. They held forth and only scampered away when the military began shooting. As dusk fell, shadows ran only to be mowed down by bullets. Like a tangled net the screams rose in the air. Some students managed to run all the way to Mendiola, cross the bridge, and gather in front of Malacañang Palace. They commandeered a firetruck, drove it straight back up, thrice – and then the gates gave way, the students spilled over onto the grounds, jumping with jubilation, only to be cut down by a hail of bullets from the marines. Their sharp eyes picked out their targets as in a shooting gallery. Those who did not fall began to run, with the Marines chasing them, driving the students toward the other direction, at street’s end, where barbed wires, row upon row of the rustiest wires, awaited them. And so it was that the students who were running away saw before them the wires like black teeth. Some of them did turn around and raise their hands. But the smell of gunpowder and blood was in the air. The marines cocked their rifles, took aim, then shot the students one by one. Seeing these, the other students just ran and ran in the direction of the barbed wires, then jumped blindly onto them, their elbows raised like wings.